The manufacturing professionals at Butler Marine Products have many years of experience producing high quality teak and fiberglass swim platforms and anchor pulpits. 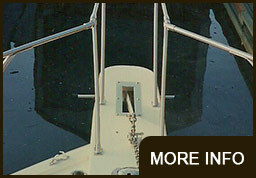 We also carry a full line of boat ladders and marine accessories. We pride ourselves on expert craftsmanship, attention to detail and fabricating to exact specifications. 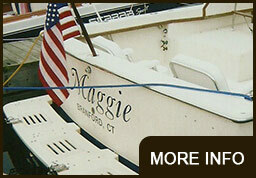 Explore our homepage for all of our fiberglass and teak products! 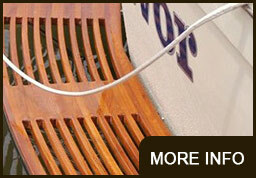 Butler’s teak transom platforms are custom built to your specifications using only the finest Burma teak. Butler Marine Products specializes in teak Grand Banks replacement platforms. 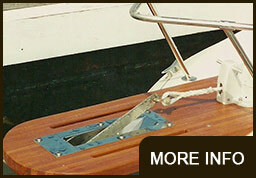 Our teak transom platforms include stainless steel, brass or vinyl rub rail. Butler’s fiberglass transom platforms are available in any length, depth and color. They can be custom built to your sketch or template. Our platforms are built without a foam or wood core for many years of maintenance free use. 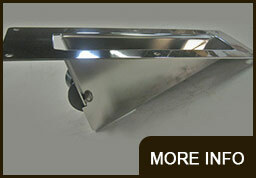 Butler’s fiberglass anchor pulpits are available in 5 different sizes and can be custom color matched to your boat. Our pulpits are made without a foam or wood core and are compatible with all of our accessories. Butler’s teak anchor pulpits are available in many standard sizes and can also be custom built to your specifications. Our pulpits will make anchoring safer and easier. Butler Marine Products offer many styles and sizes of ladders to get you from the boat to the water and back. We can also custom build ladders from your specifications or from a sketch. 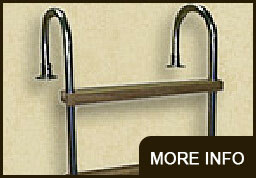 We carry a full line of anchor pulpit rail accessories, as well as ladder and support bracket fittings. We also offer several different styles or anchor pulpit rollers including our popular Full Slot Anchor Rollers.